Masterpiece Raw Canvas 40x60 | Linen & Stretcher Bars | Linen, Paper & Foils | Kremer Pigments Inc.
100% Cotton; Heavyweight, 11.5 oz raw weight, unprimed; Canvas Depth: 1-1/2"; Solid Pine or Fir Stretcher Bars from the sustainable forests of the Pacific Northwest. No finger joints are allowed, which tend to fail under pressure and over time. Precision machined tongue-and-groove corners allow you to increase the canvas tension. Cross Brace Included. Bars are slotted in the center to accept cross braces. Canvas 16" x 20" and larger is cross-braced for additional strength and tension in the canvas and on the frame. Patent Pending Keyable Cross Braces allow you to add tension to the middle of the canvas, where it s needed the most. Both corner keys and brace keys are pre-installed. Stretched using our MuseumWrap method yielding a balanced tension across the surface of the canvas, and a drum-tight stretch that is up to 50% tighter than other methods. Folded corners mean a canvas that is uncut and perfectly intact, allowing the canvas to be removed from the frame and re-stretched. Staple-free edges are perfect for frameless presentation, and folded corners with an uncut selvage allow for re-stretching if desired. 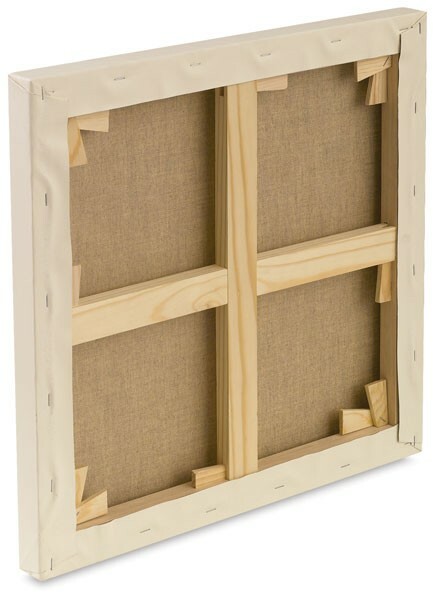 We can ship any stretched canvas measuring up to 40" on any side. Pick up in-store for larger sizes. This product requires additional shipping costs. We will contact you with a shipping quote when ordering this product. 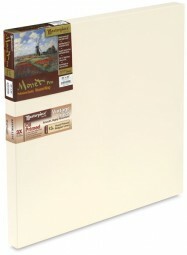 Customer evaluation for "Masterpiece Raw Canvas 40x60"